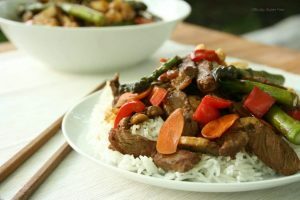 This Gluten Free Korean BBQ Beef Vegetable Stir Fry is made with Tender Marinated Beef and my Favorite Mix of Stir Fried Vegetables. One of the best things about stir fry’s is that so many things go well in them. So it’s a great way to use up what vegetables you have in the fridge. 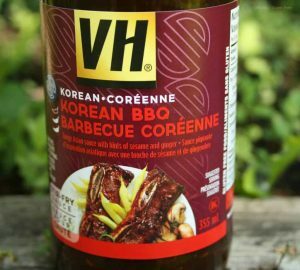 I used VH Korean BBQ Stir Fry Sauce which is a Tangy Asian Sauce with hint of Sesame and Ginger and it’s labeled Gluten Free. I’m glad I found it because it’s so easy to throw together and my family loved it. it really made dinner time so stress free. If you’re looking for another Delicious and Super Easy Beef Recipe, then try this Gluten Free Beef Stew recipe. It’s another easy way to make sure your family gets a healthy Dinner. It can be make ahead of time with a slow cooker which makes this recipe even easier. 2. Dice, then set aside the onion, cauliflower, asparagus, mushrooms, red pepper and carrots. 3. In a large frying pan or Wok over medium/high heat, sear the beef until 3/4 of the way cooked. Turn the heat down to medium, then add the chopped vegetables. 4. Add the rest of the bottle of korean bbq stir fry sauce. Mix until well combined, then let simmer for 5- 10 minutes. 5. Serve on top of the prepared rice or rice noodle. This Korean BBQ Beef Vegetable Stir Fry serves Four People. 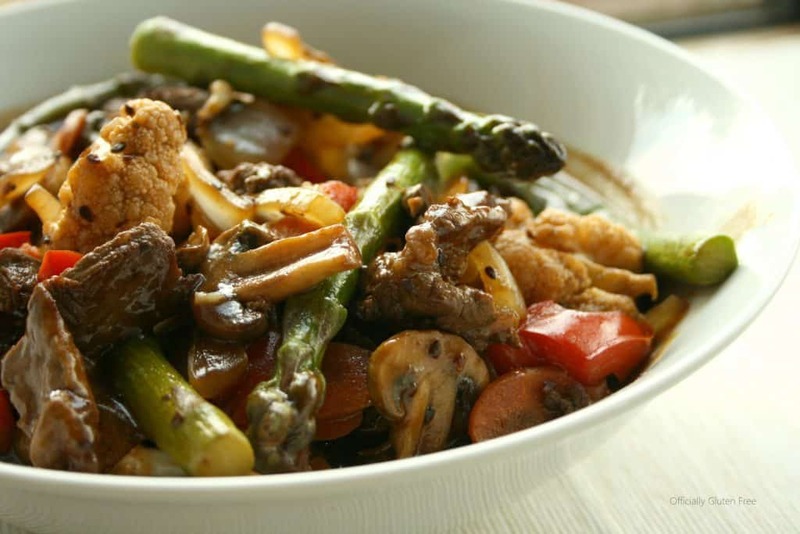 Dice, then set aside the onion, cauliflower, asparagus, mushrooms, red pepper and carrots. In a large frying pan or Wok over medium/high heat, sear the beef until ¾ of the way cooked. Turn the heat down to medium, then add the chopped vegetables. 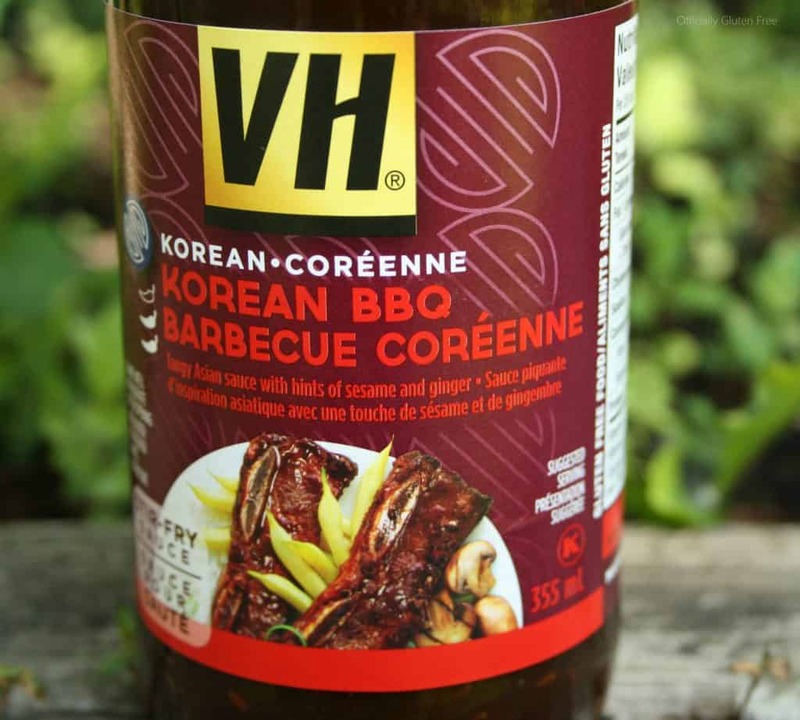 Add the rest of the bottle of korean bbq stir fry sauce. Mix until well combined, then let simmer for 5- 10 minutes. Serve on top of the prepared rice or rice noodle.